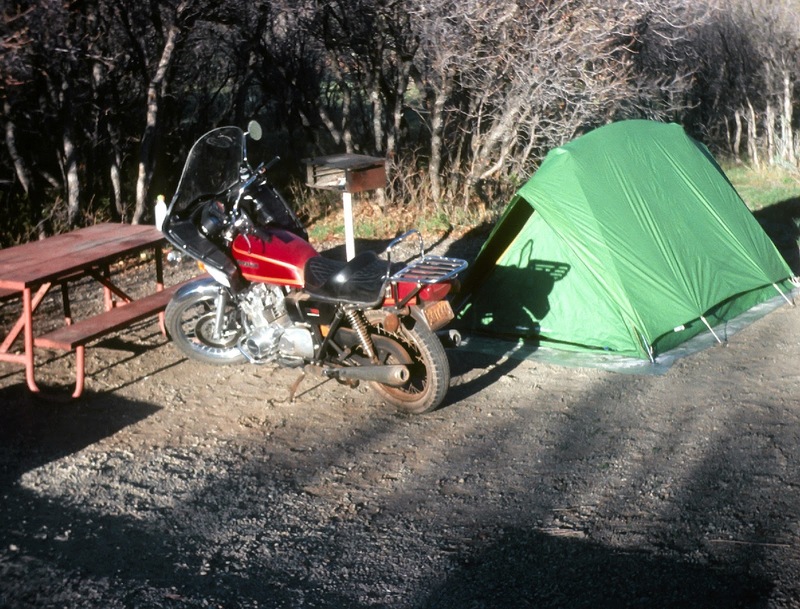 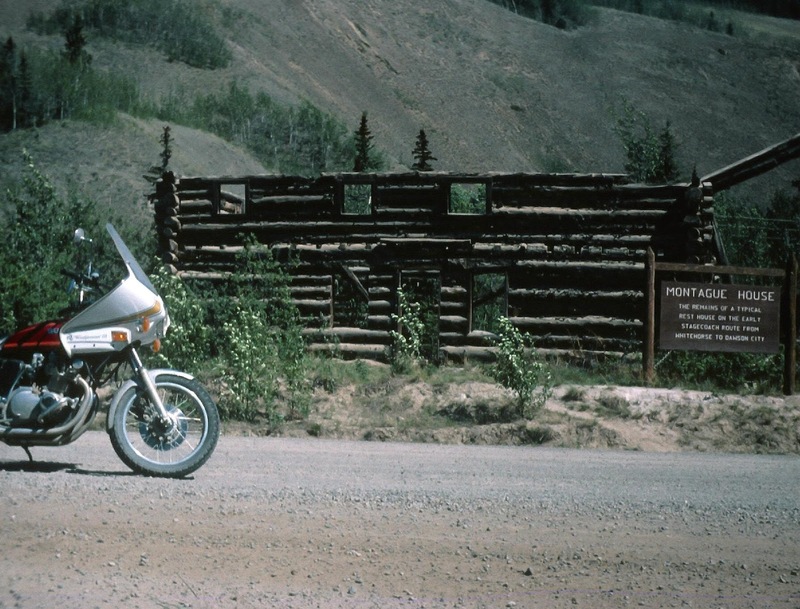 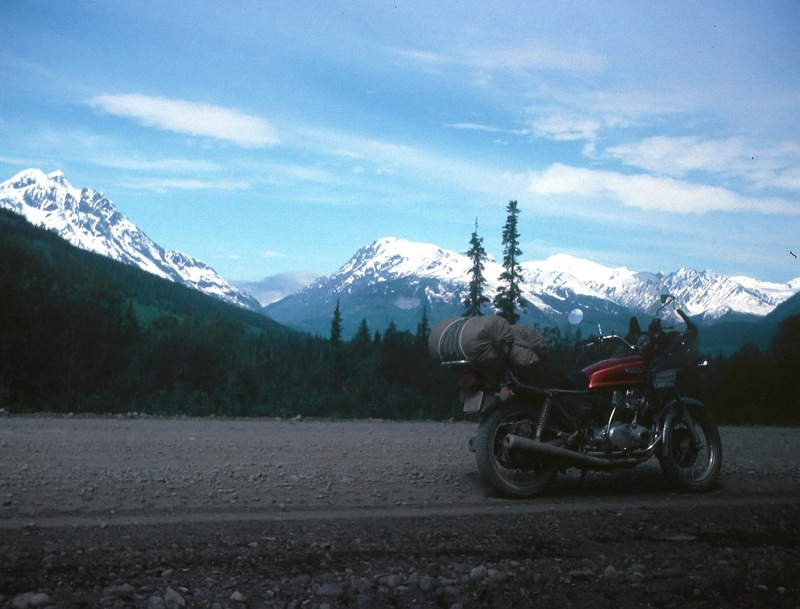 I traveled alone on this Alaska trip with a new 1977 Suzuki GS750 that I planned to break in during the first few days of the trip. 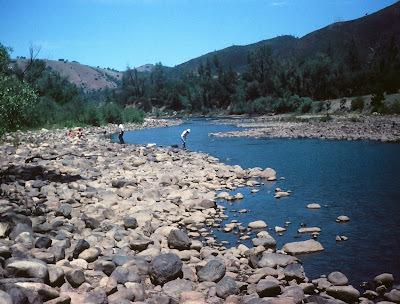 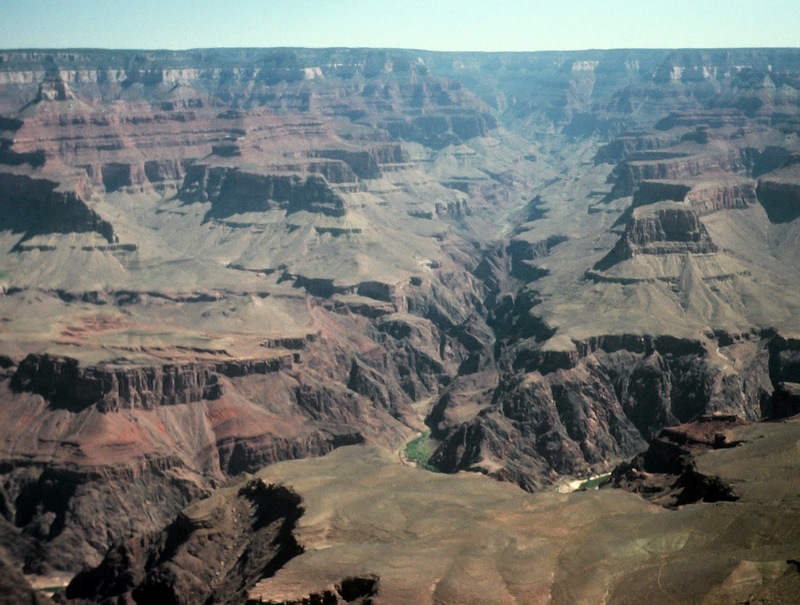 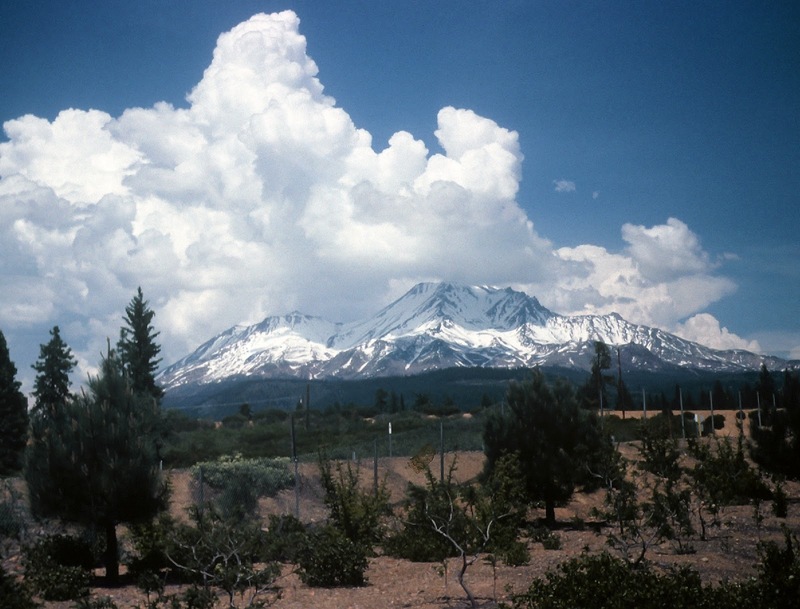 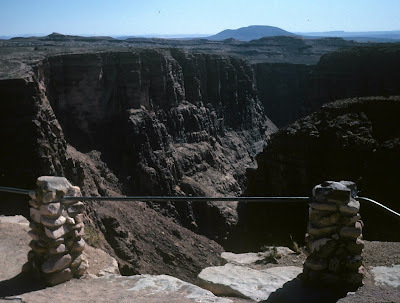 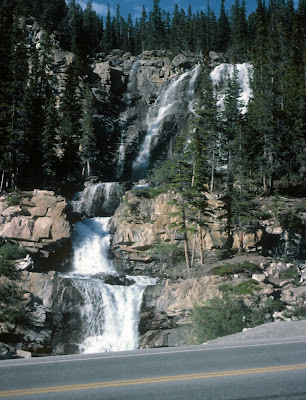 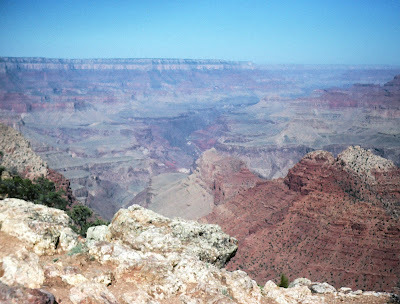 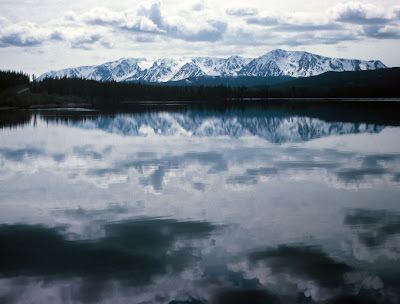 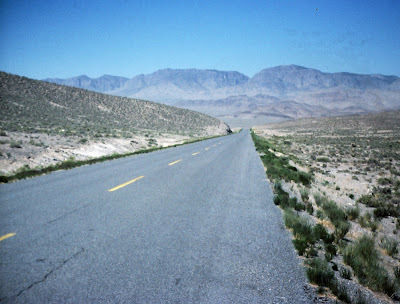 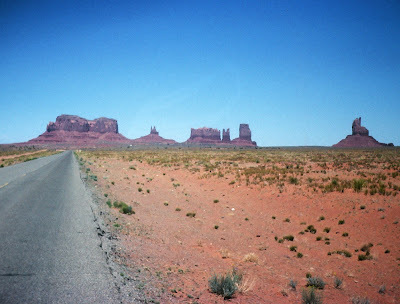 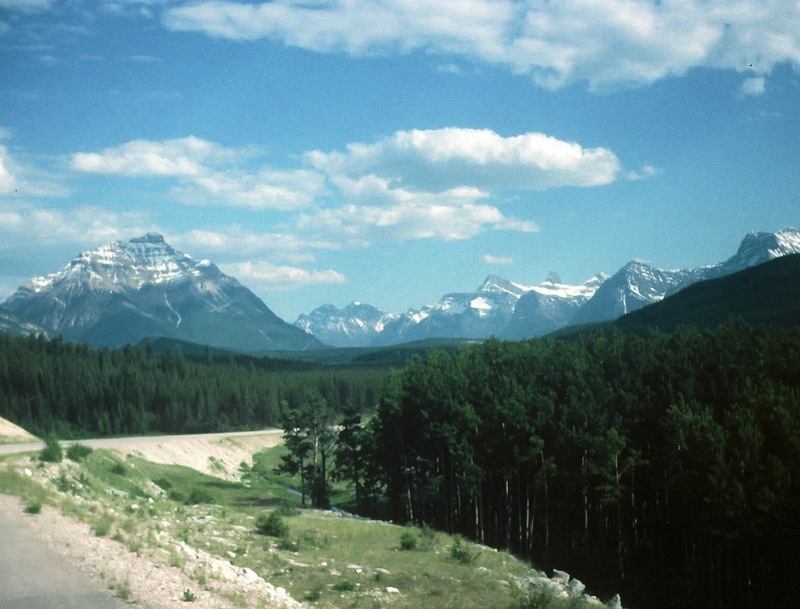 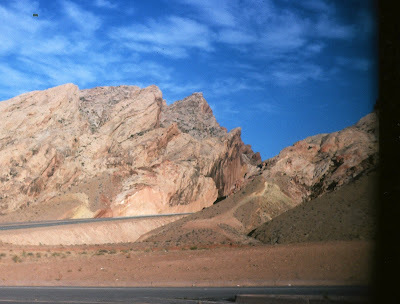 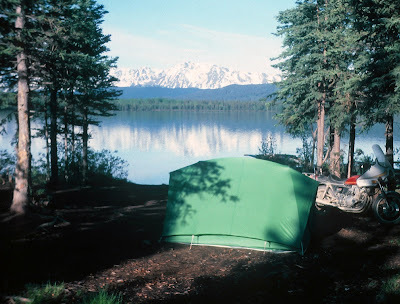 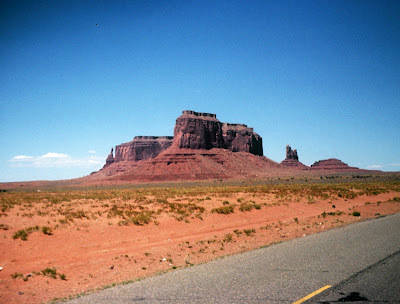 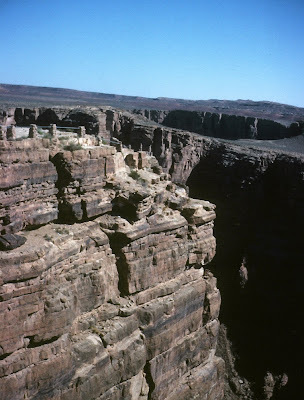 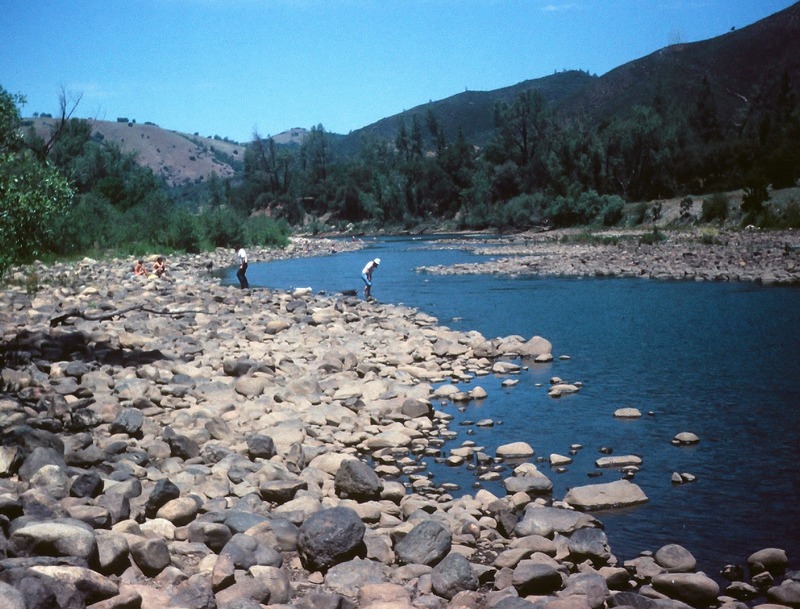 On my way to Alaska I planned to visit the Rocky Mountains, the Grand Canyon, and also with my daughter Donna who was stationed at Beale AFB, north of Sacramento. 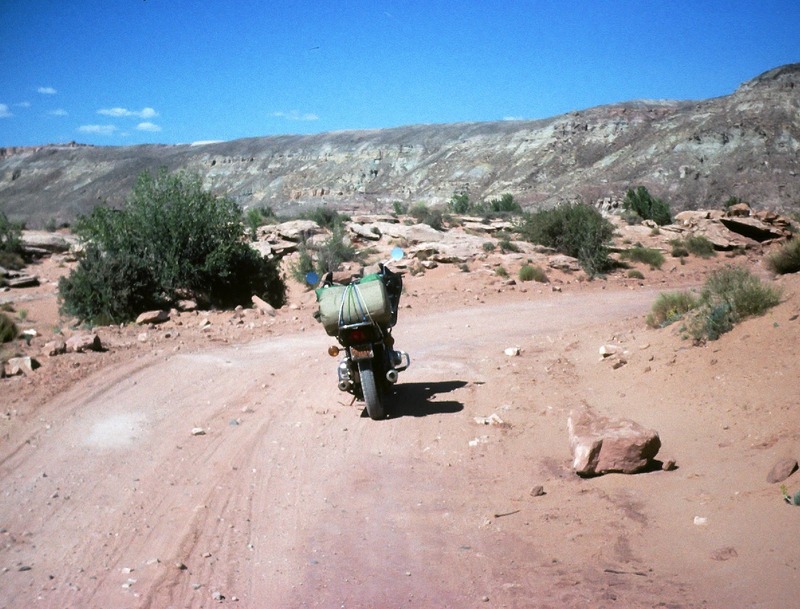 The trip totaled 12, 741 miles in 27 days. 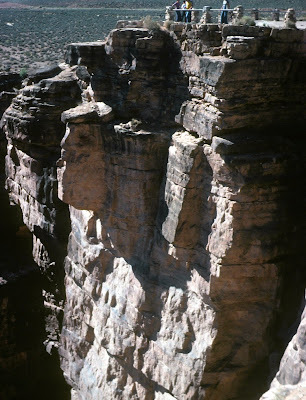 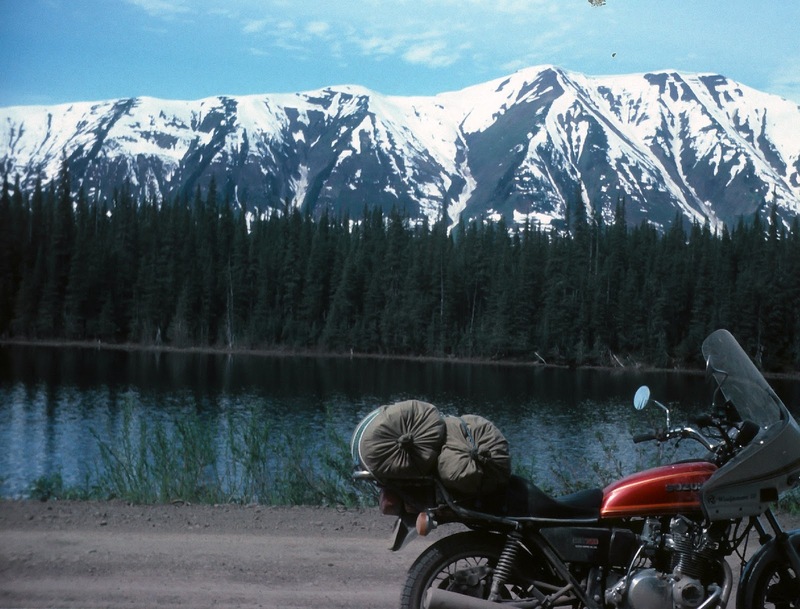 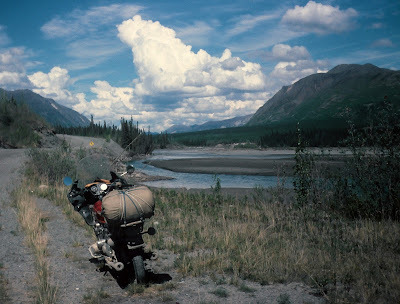 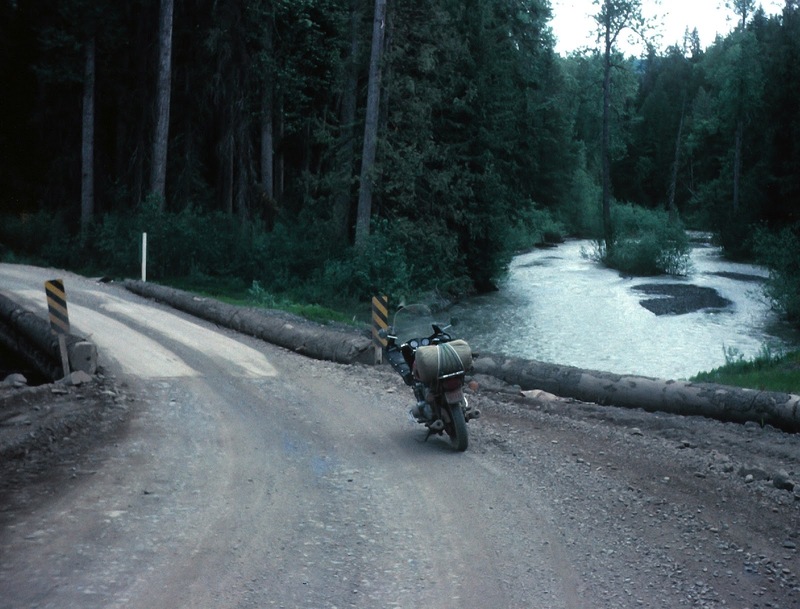 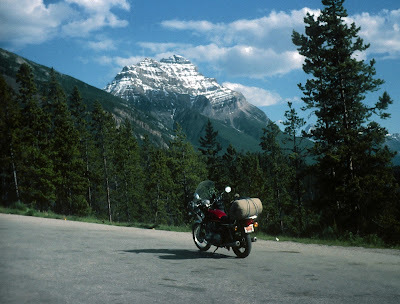 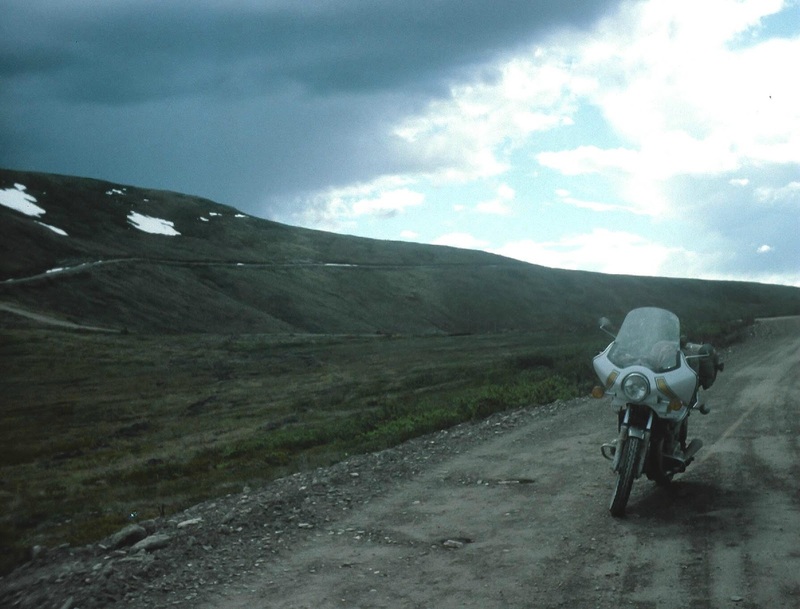 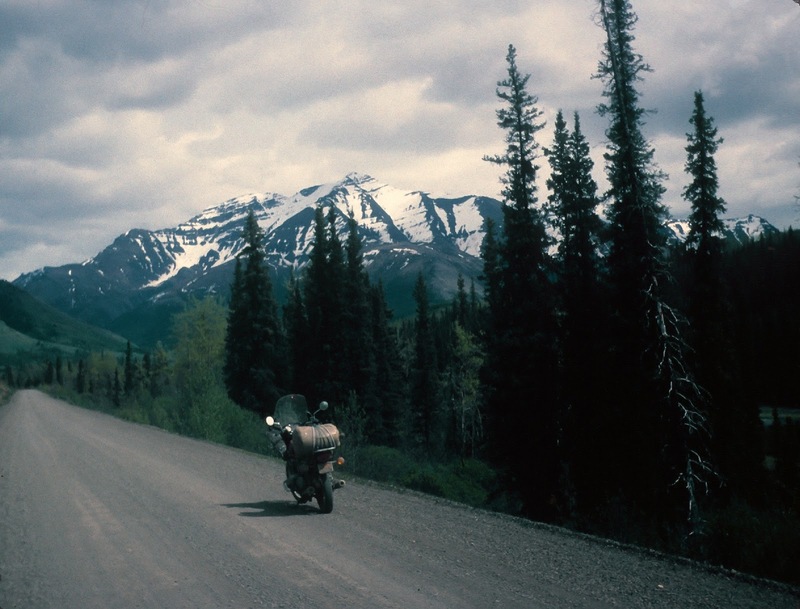 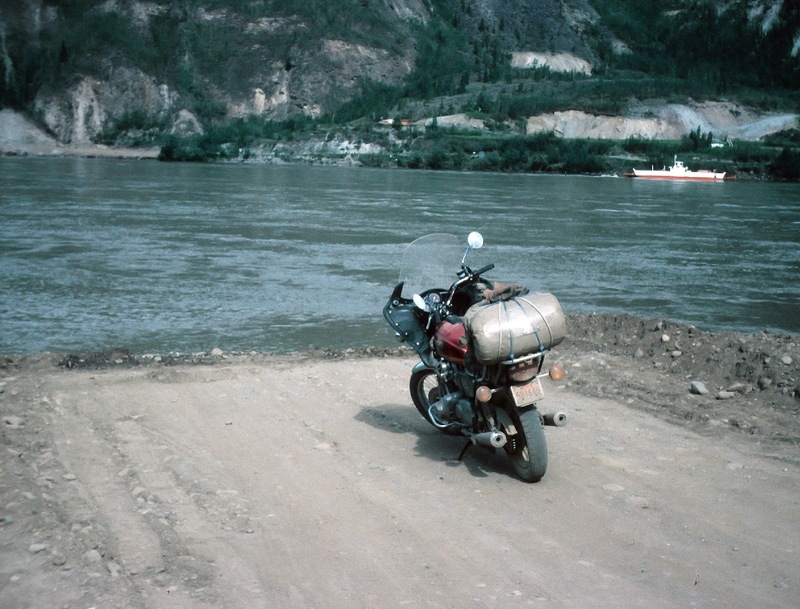 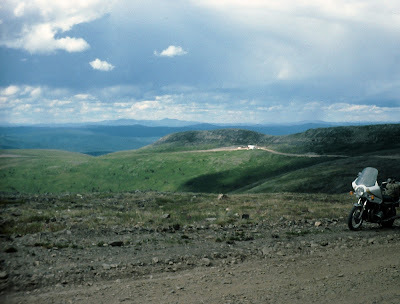 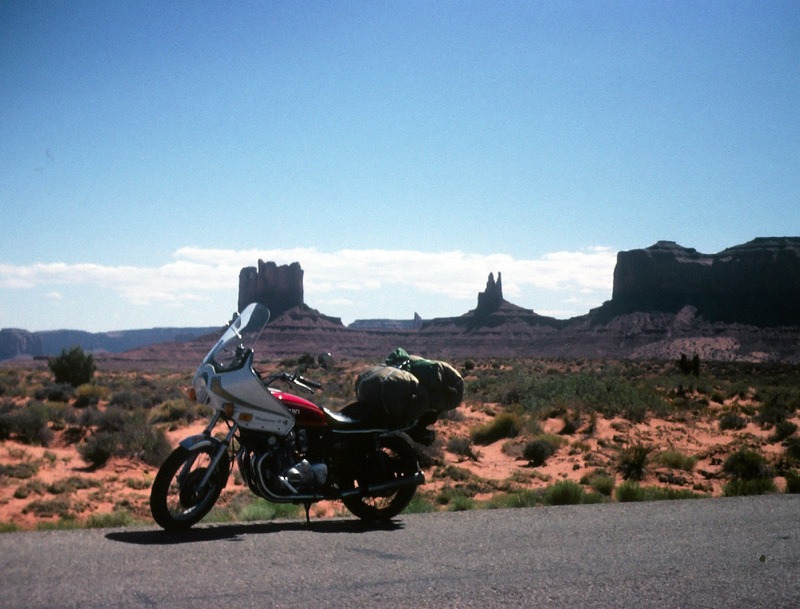 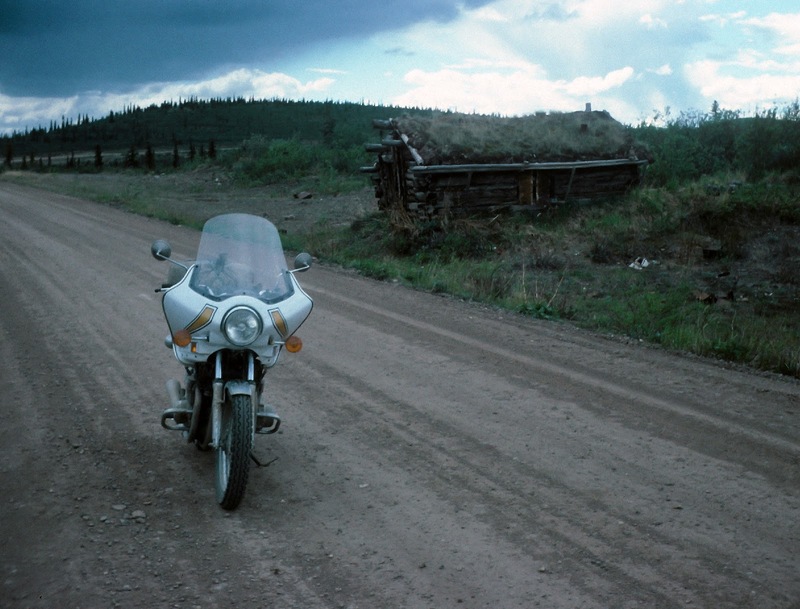 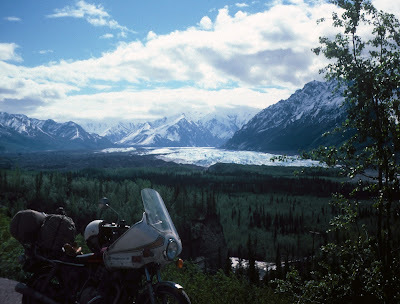 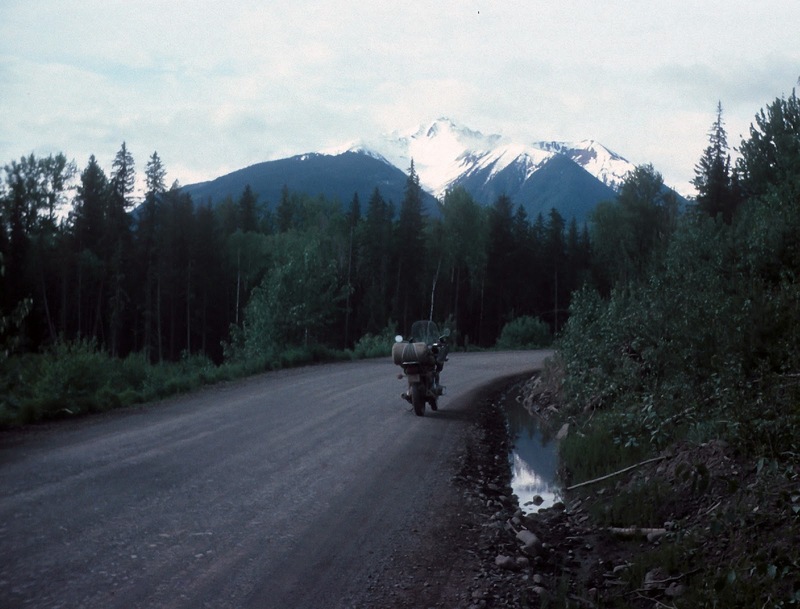 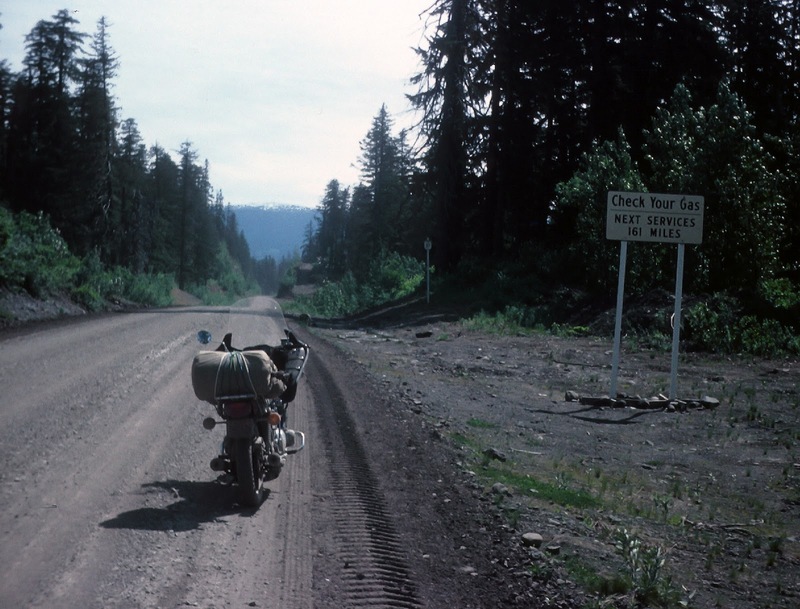 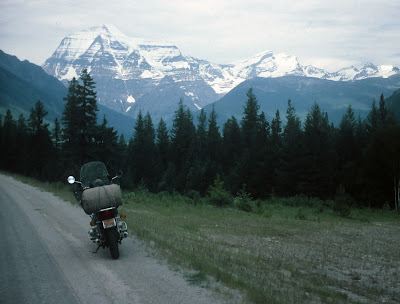 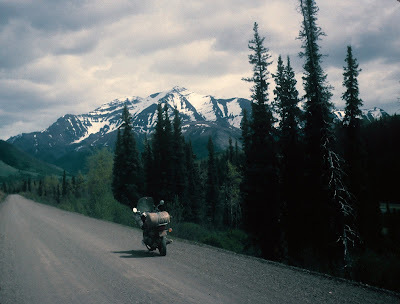 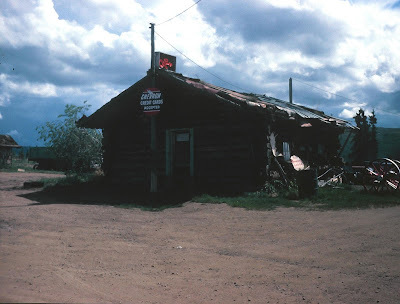 It turned out to be an unforgettable experience, the details of which are in my book, “Motorcycling Stories – Adventure Touring from the Northwest Territories to the Yucatan Peninsula.” I carried a tiny 110 Kodak camera and originally had slides made from the film that I converted to computer files a few years ago. 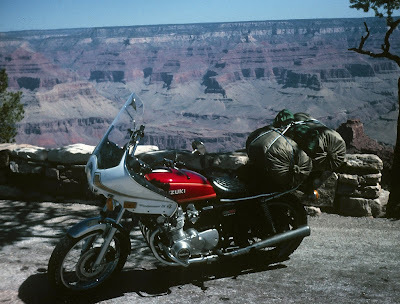 I uploaded the best of those conversions and posted them below. Click on the photos to enlarge them. 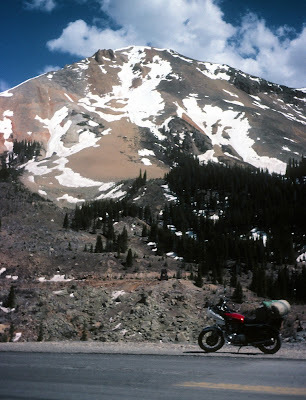 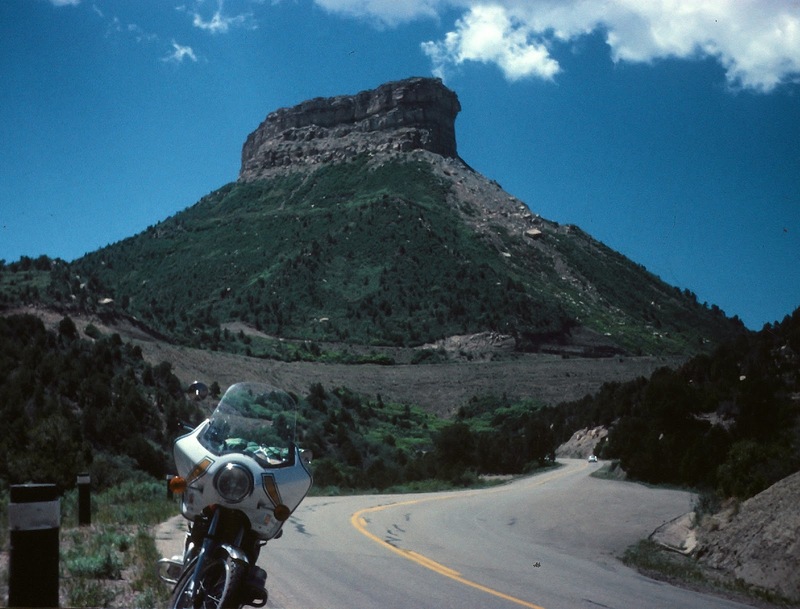 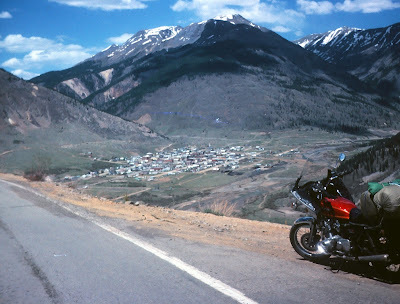 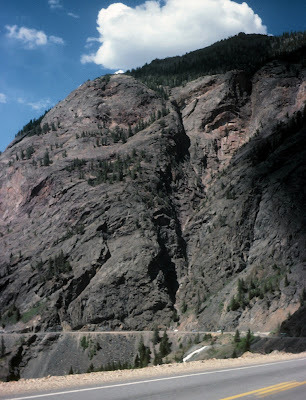 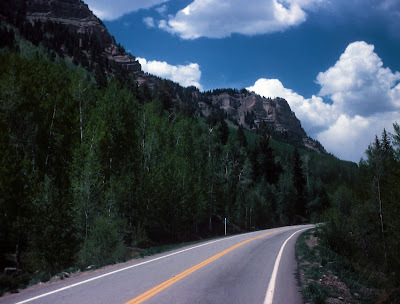 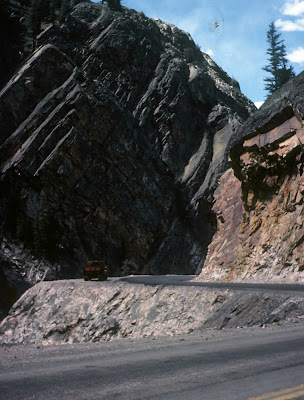 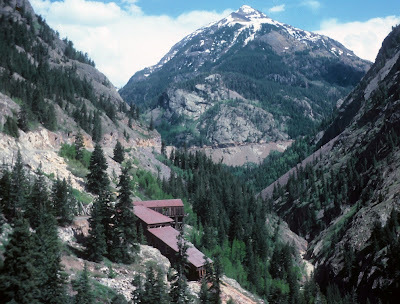 US 550 in western Colorado, between Durango and Ouray - a very beautiful ride. 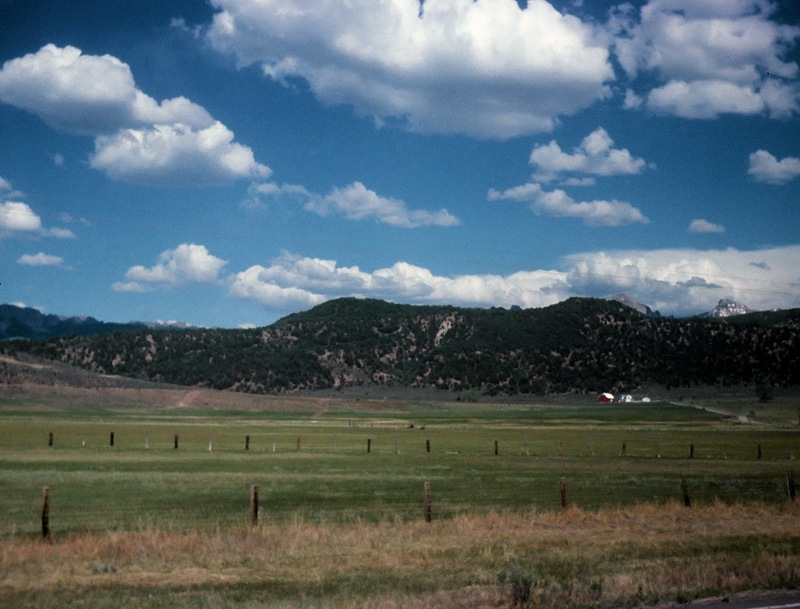 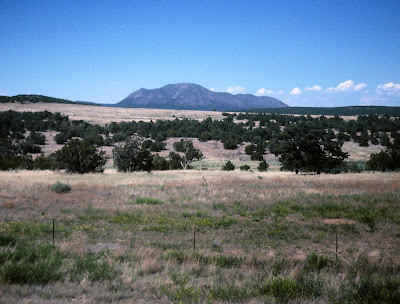 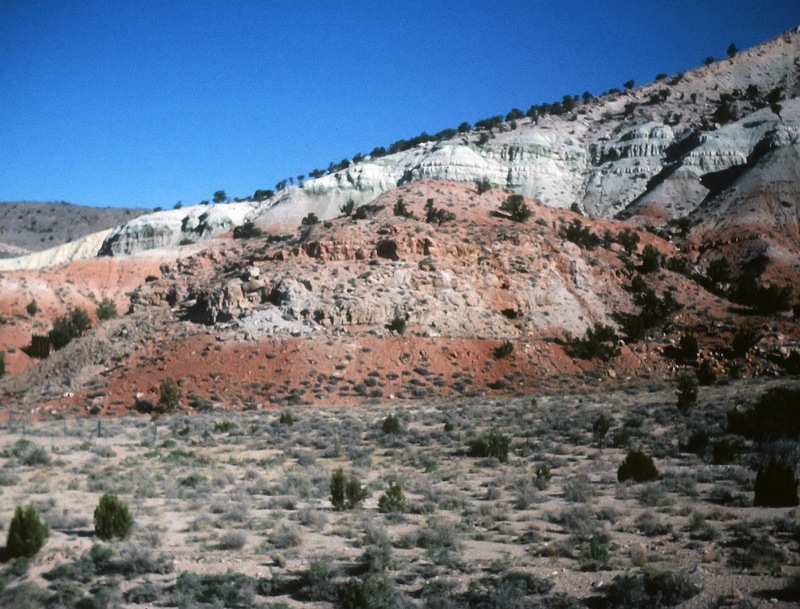 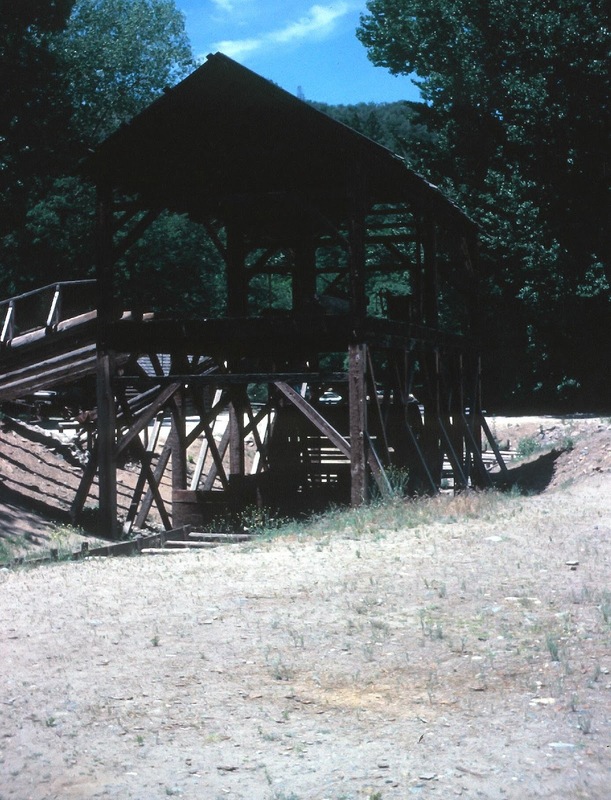 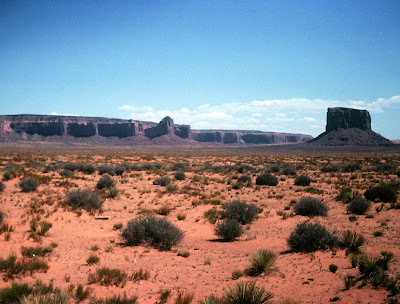 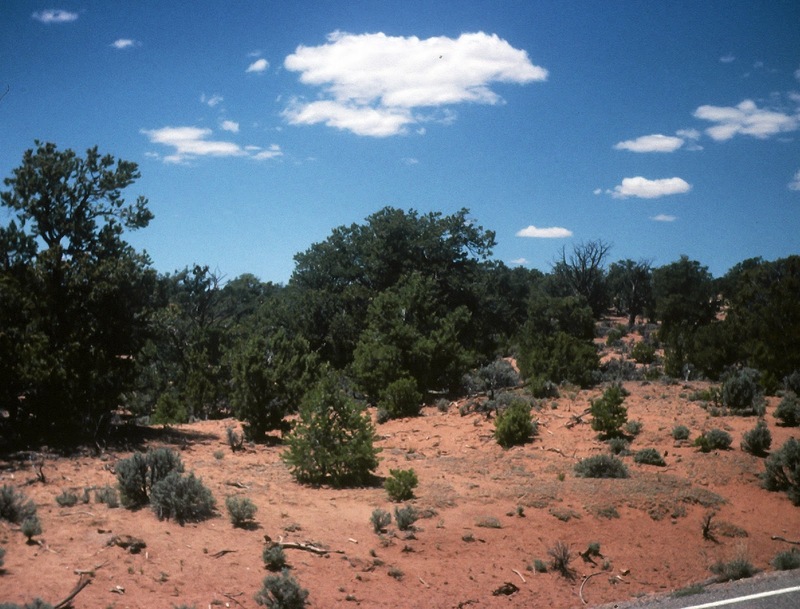 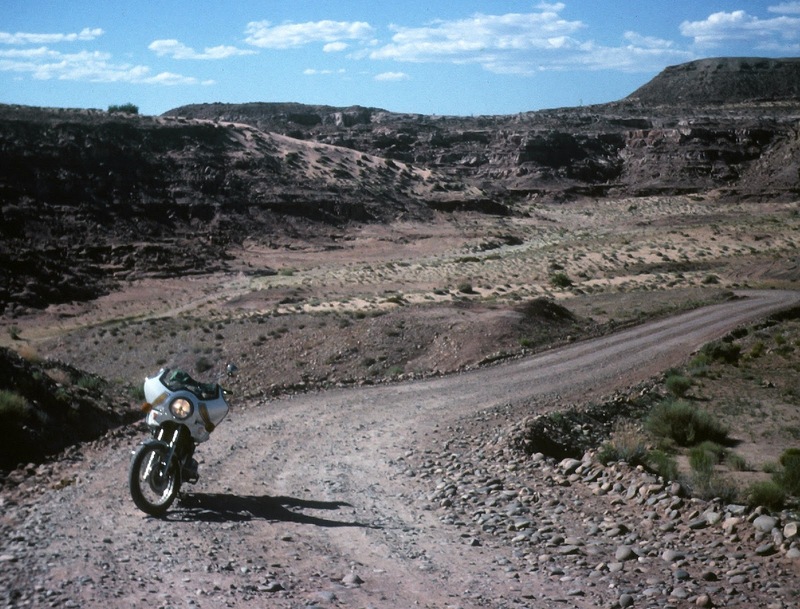 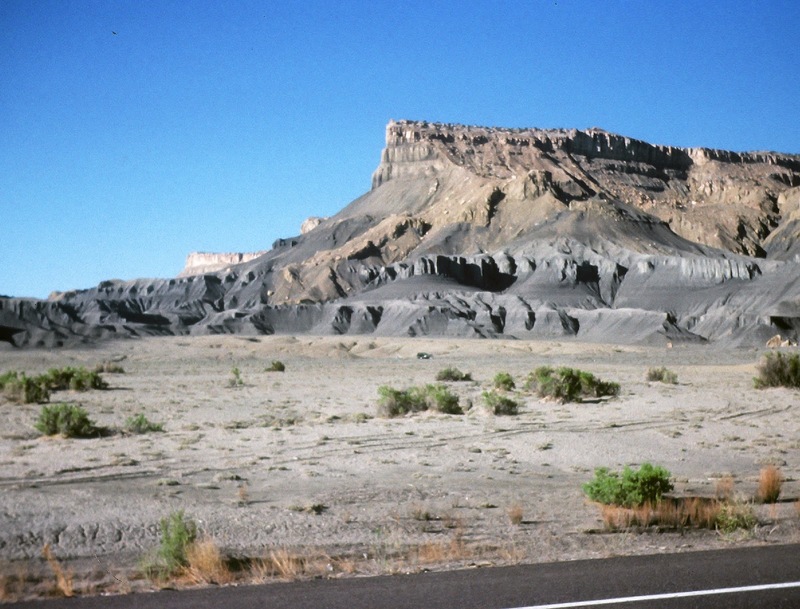 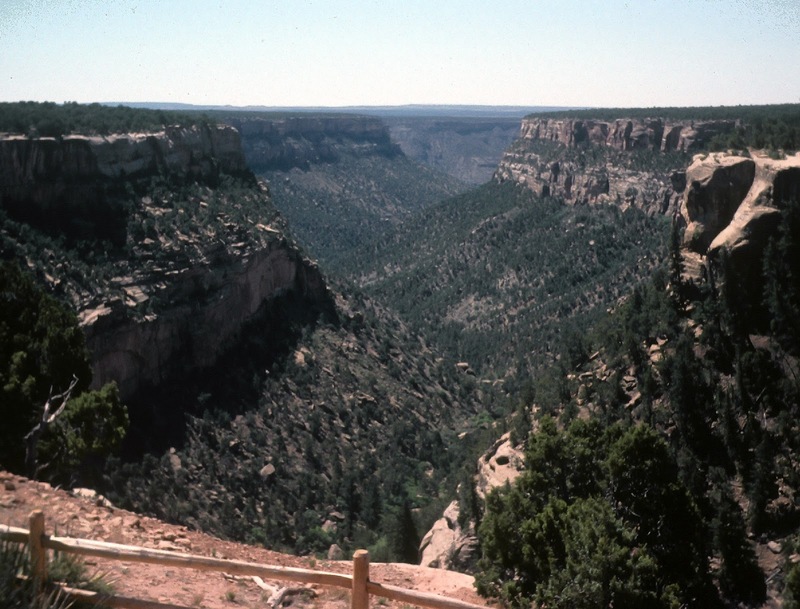 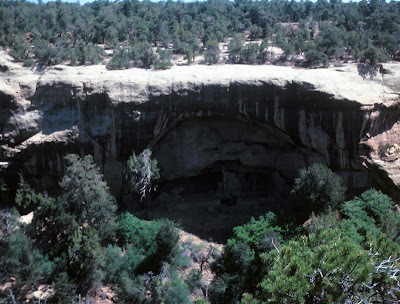 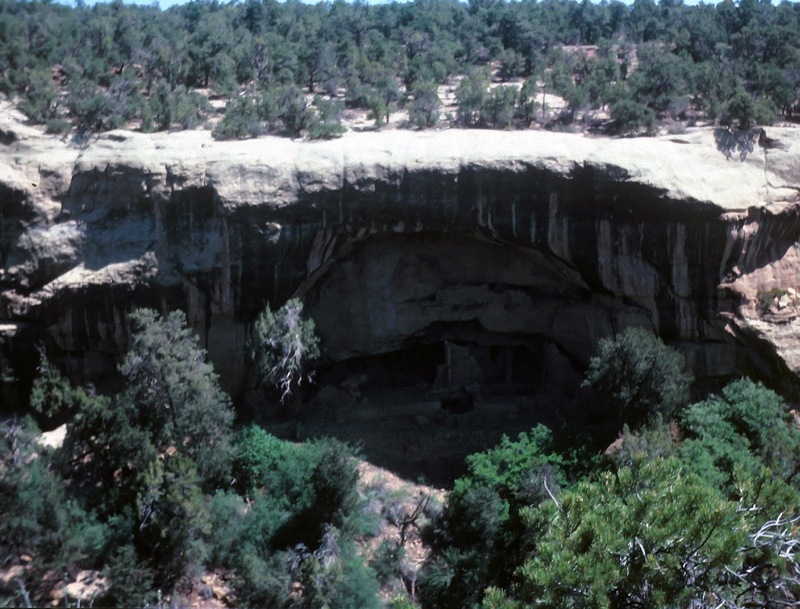 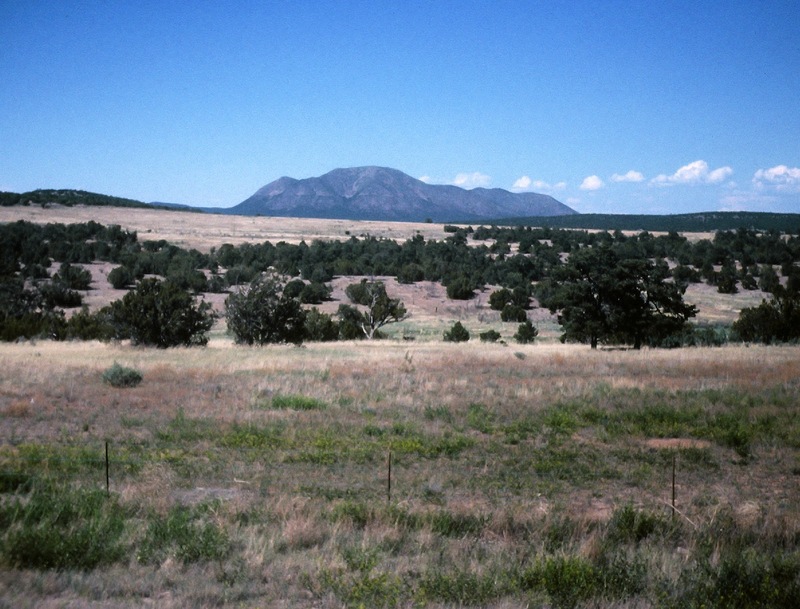 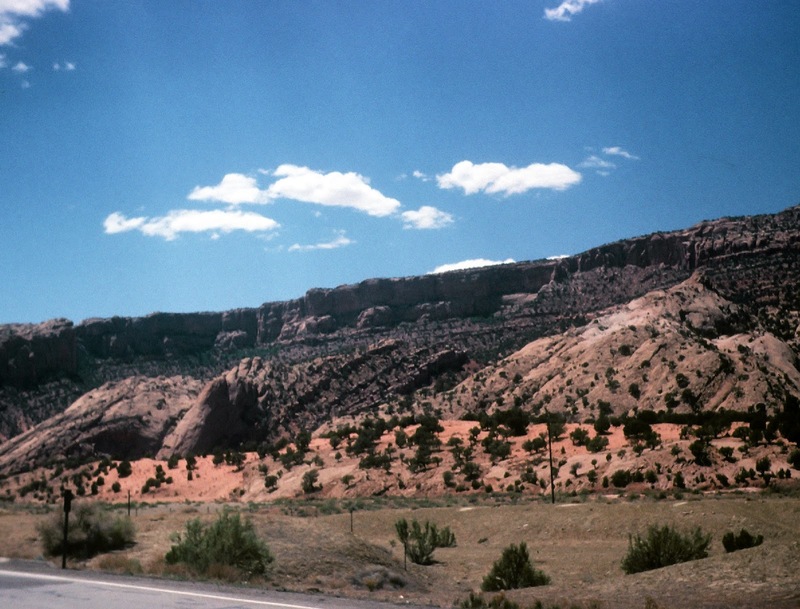 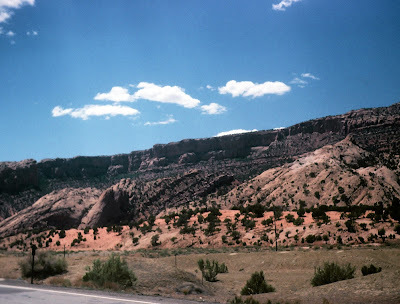 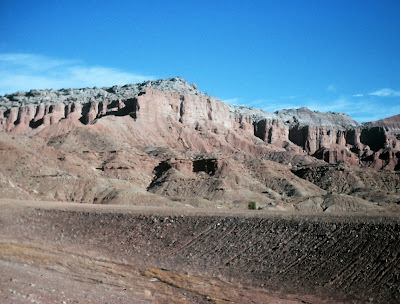 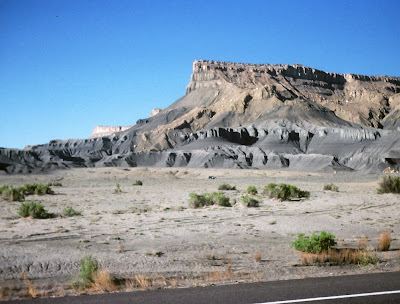 Between Butte, Utah and Montezuma Creek, Utah before there was a direct road. 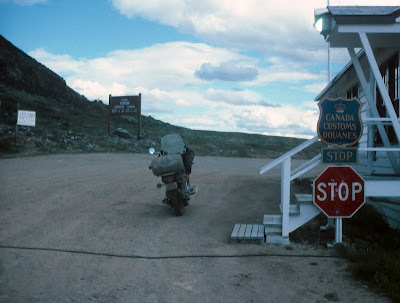 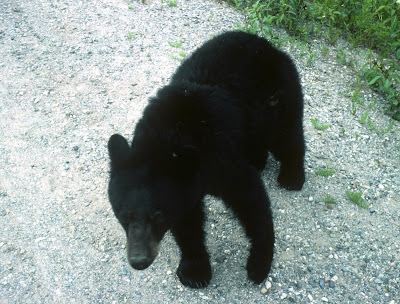 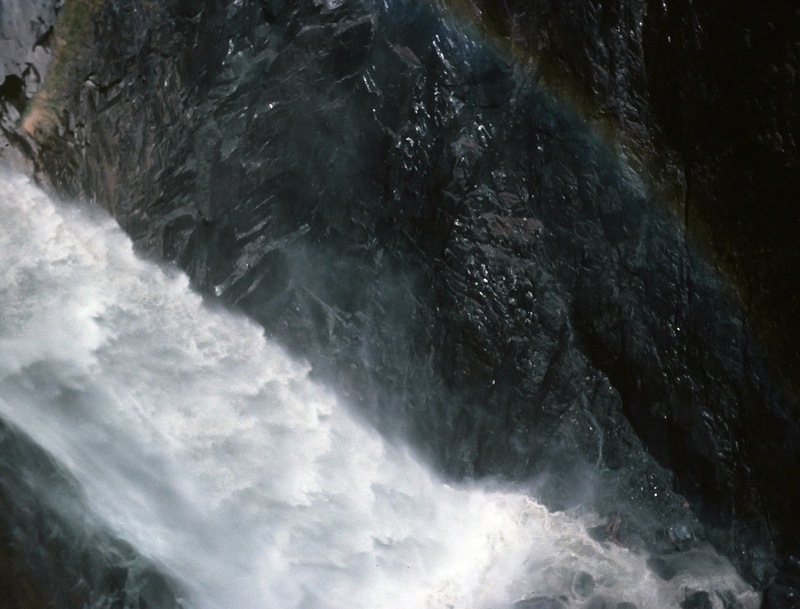 I had passed a sign many miles back that said, "Danger - Do not enter this area without a guide." 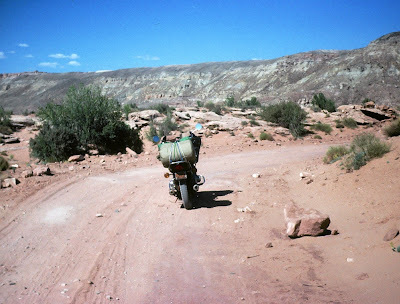 A few times I feared that I had gotten lost. Much of the first 92 miles between Kitwanga and Meziadin Lake Junction was under heavy construction. 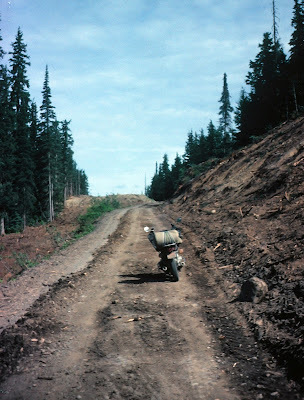 A few of those construction sites had freshly-leveled sections with soft dirt that was difficult to ride through, especially due to the way I had the bike loaded with too much weight over the rear wheel. 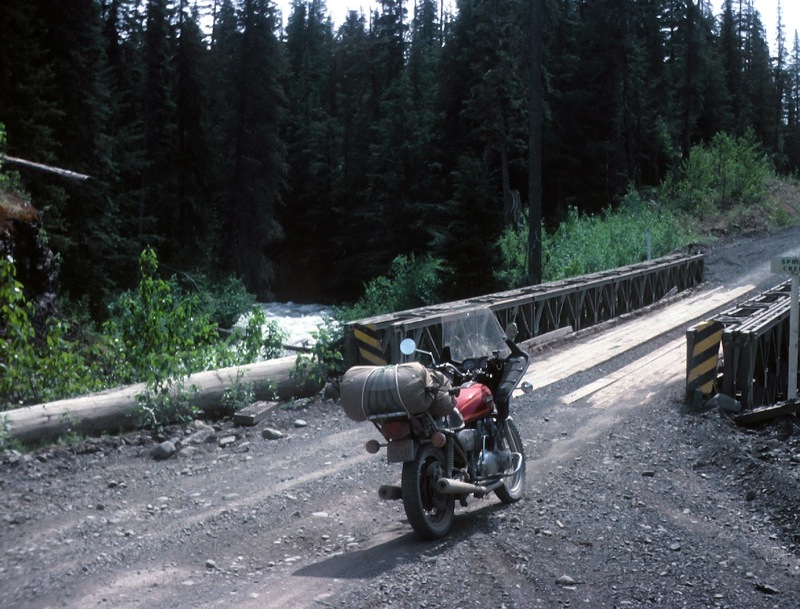 There were dozens of narrow one-lane wood-plank bridges over the many rivers and streams. 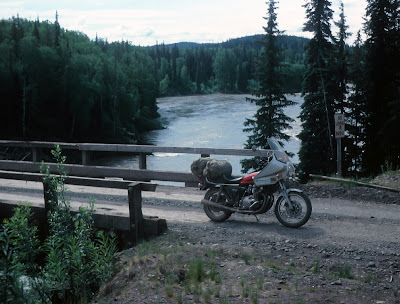 The wooden side rails were quite close on most and I usually had to slow down before hitting the planks to make sure there weren't loose stones that would throw me too far off course.A few times I came very close to side-swiping the wooden rails. 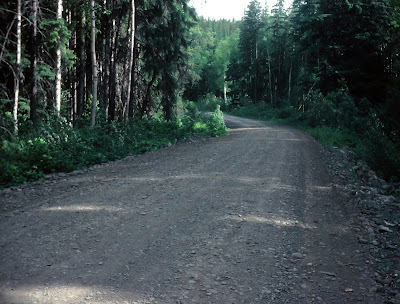 The forest was very close to the edge of the narrow road in some places. 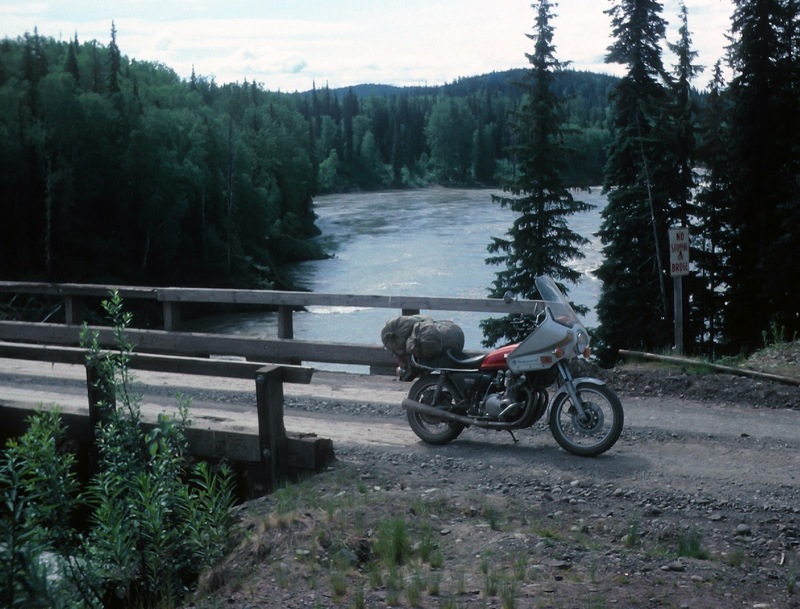 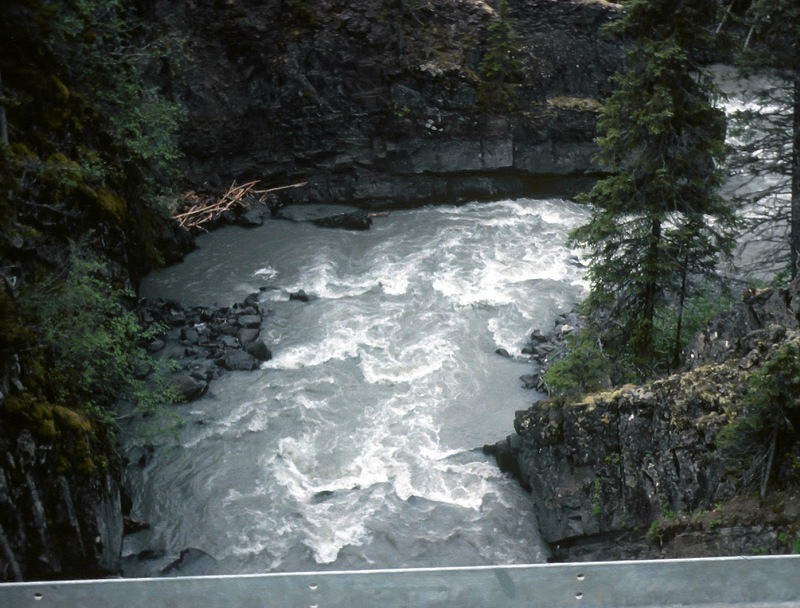 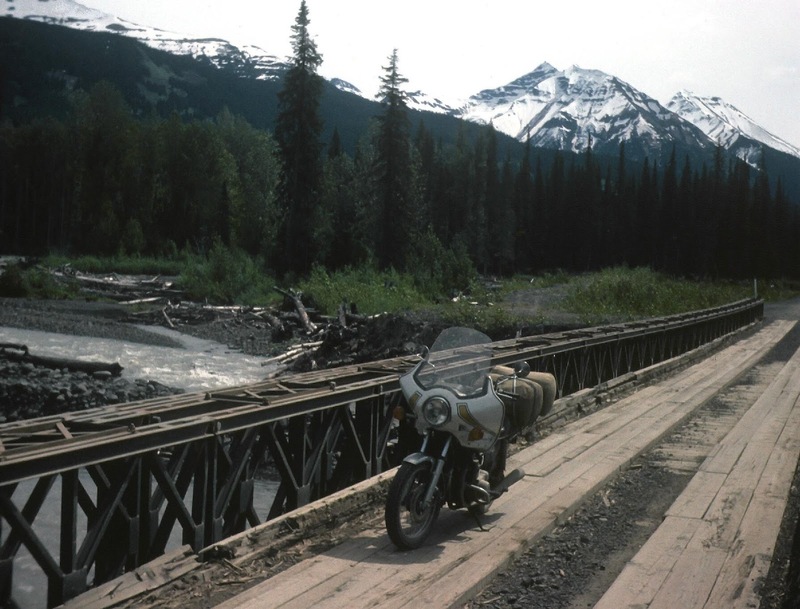 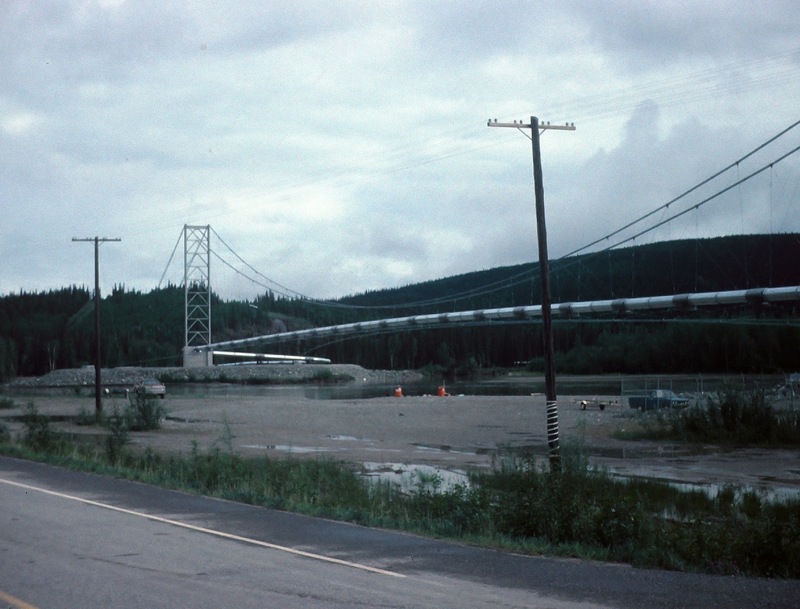 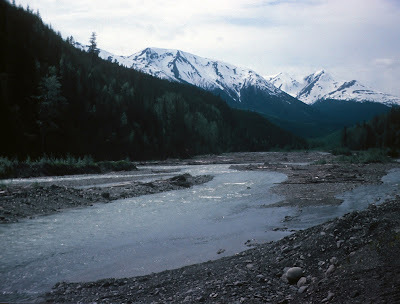 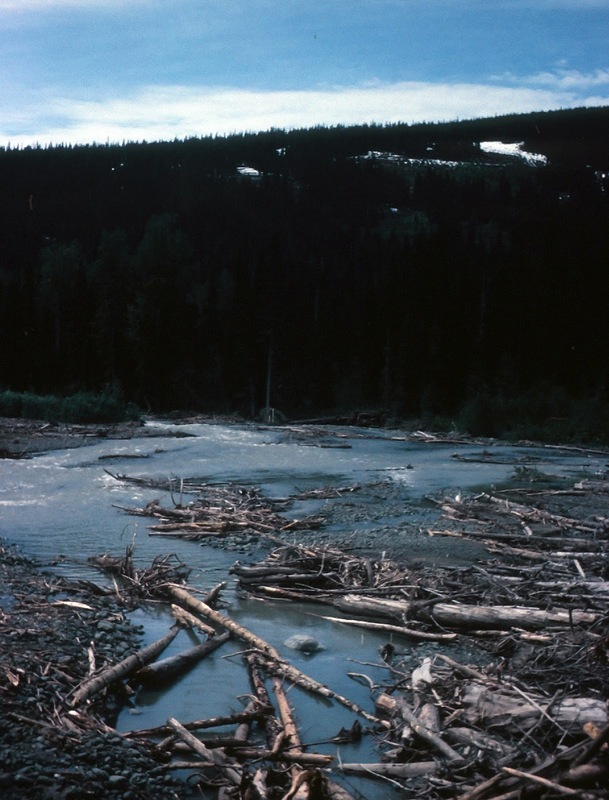 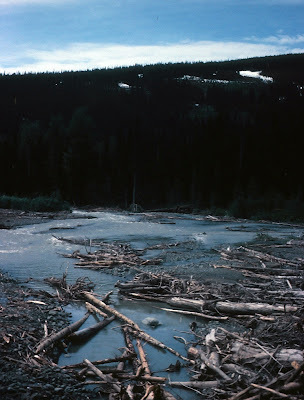 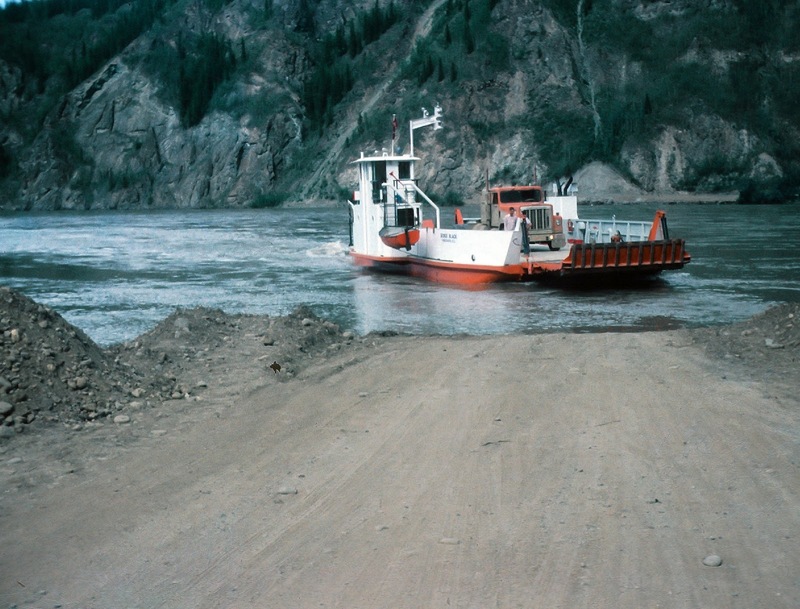 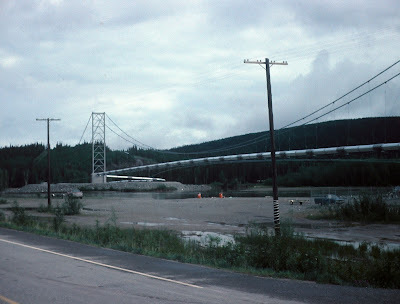 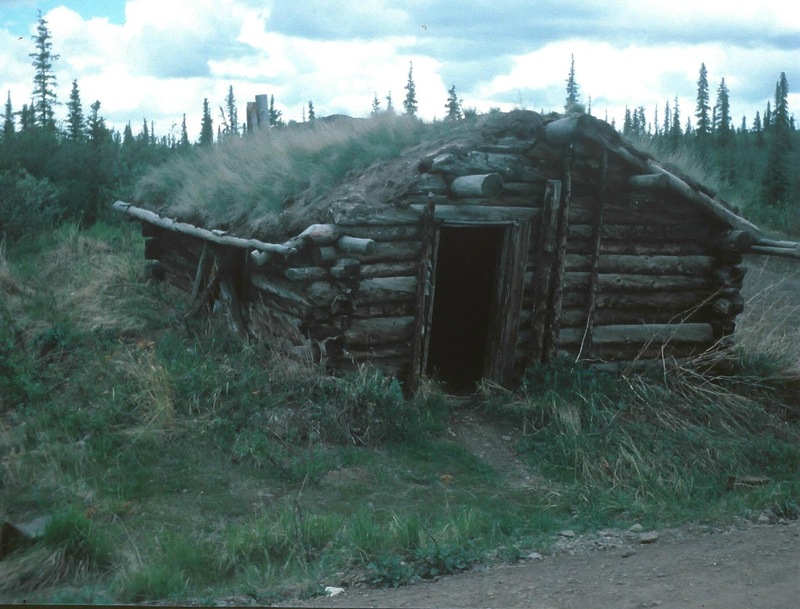 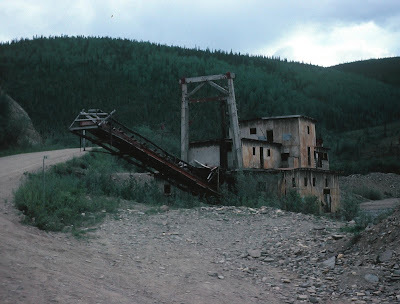 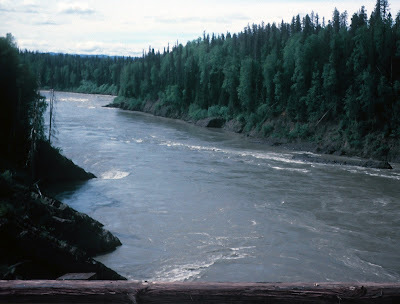 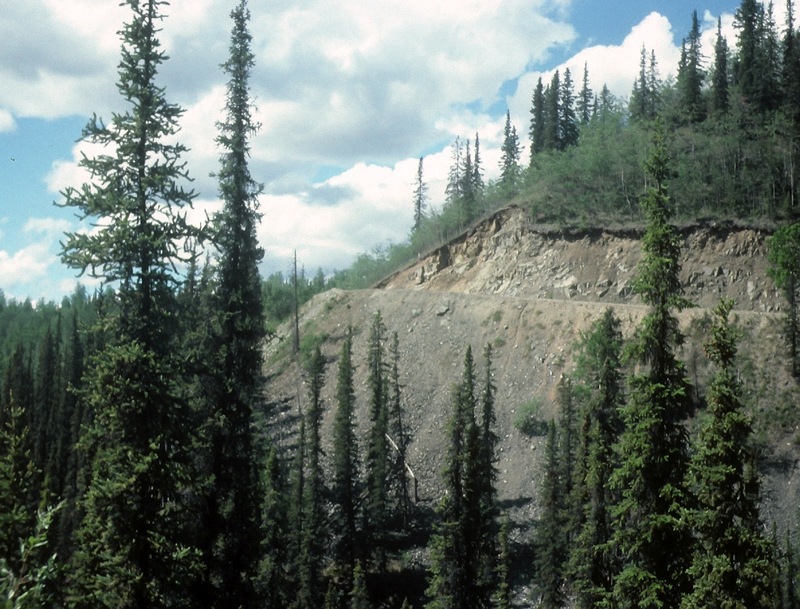 The longest of the single-lane wood-plank bridges spanned the Nass River just before reaching Meziadin Lake Junction, BC, which was the junction with the Stewart, BC and Hyder, AK Access Road. 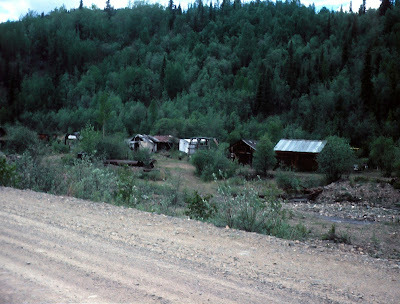 BC Timber Sales was harvesting lumber in the area and the huge 18-wheel logging trucks had the right-of-way on the narrow road. 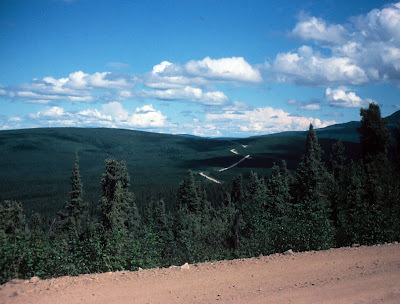 One of those trucks ran me off the road into the ditch at one point. 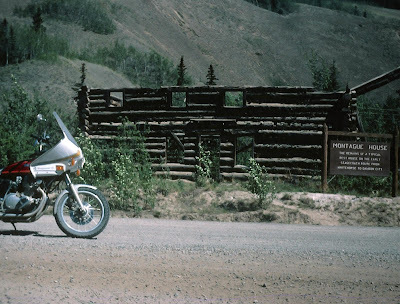 He never even slowed down. 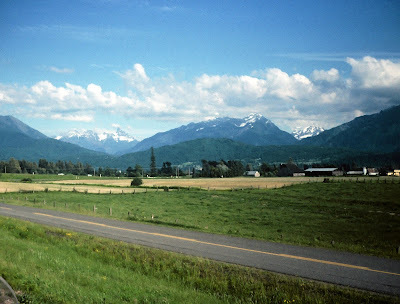 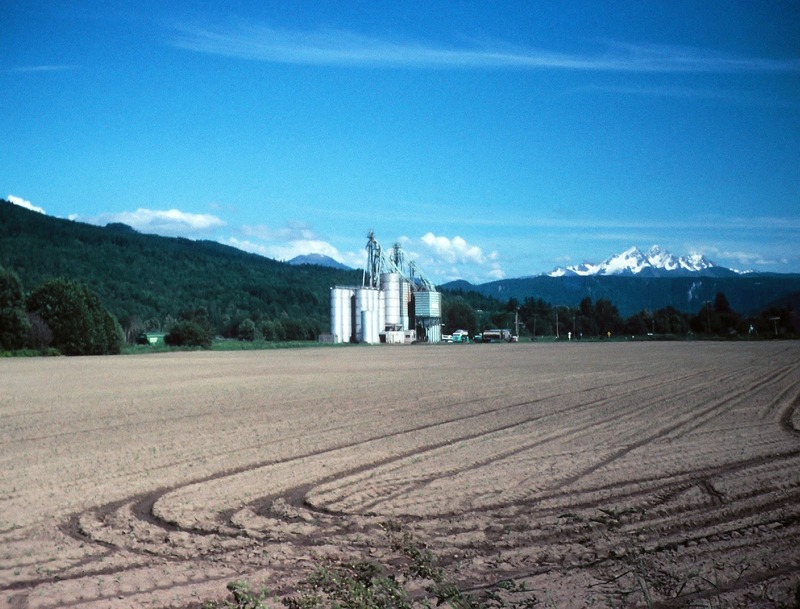 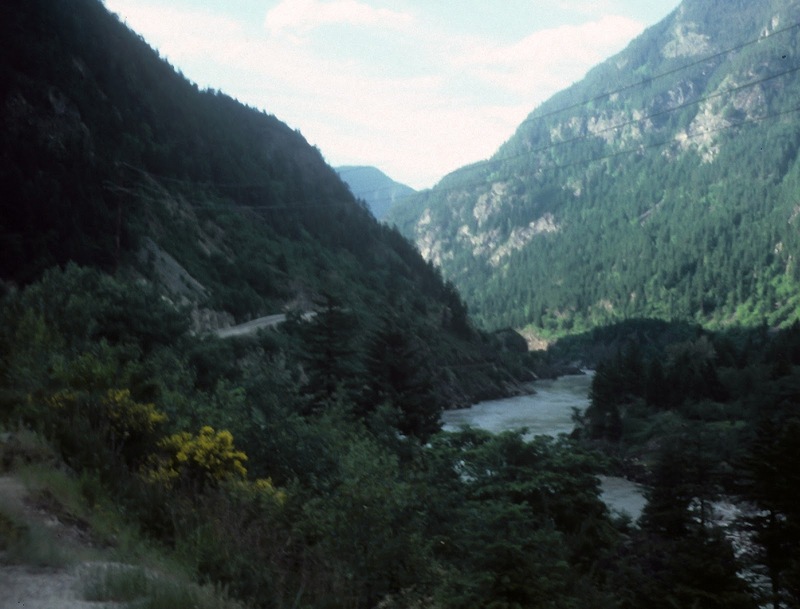 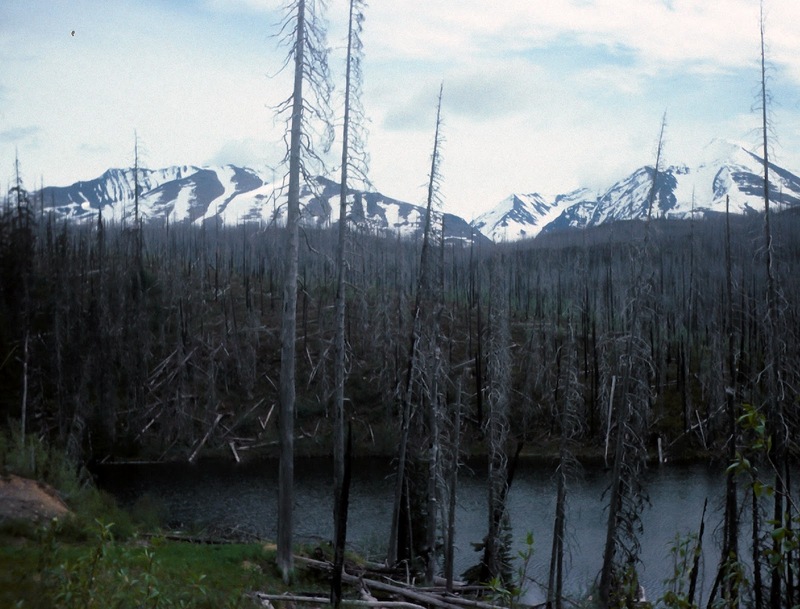 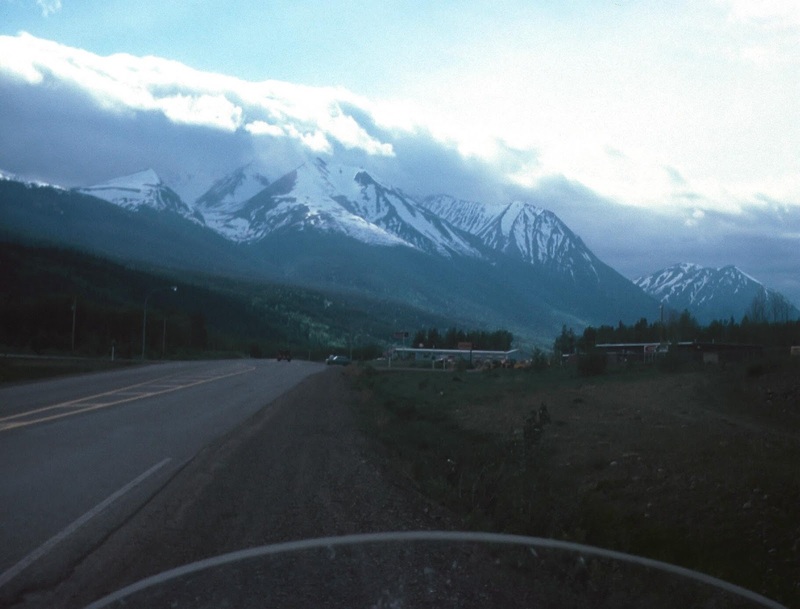 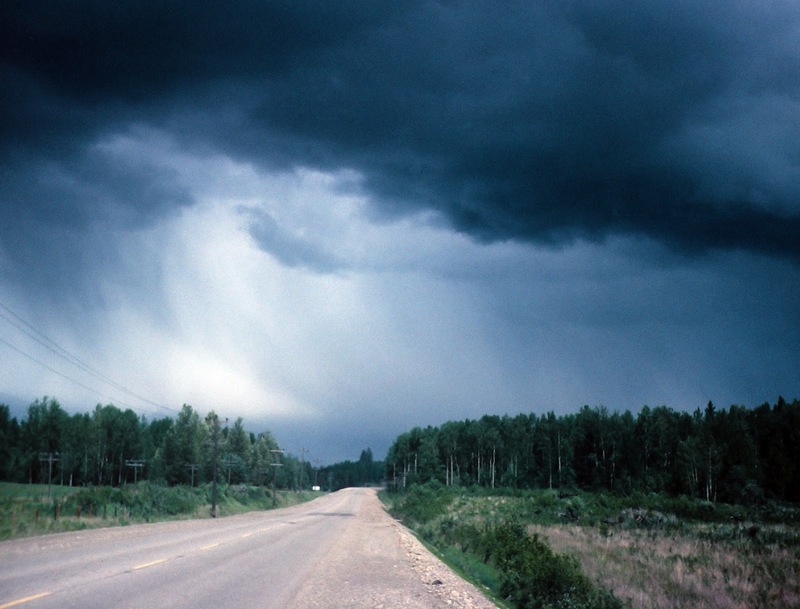 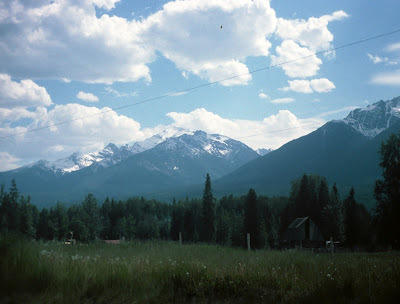 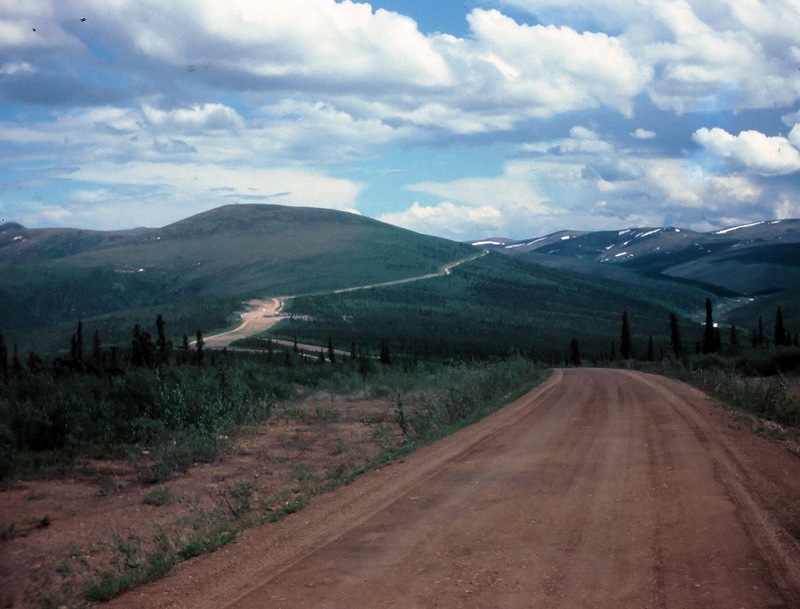 The next "anything" leaving Meziadin Lake Junction was 161 miles as the road passed through a beautiful valley between the Skeena Mountains and the Coastal Range. 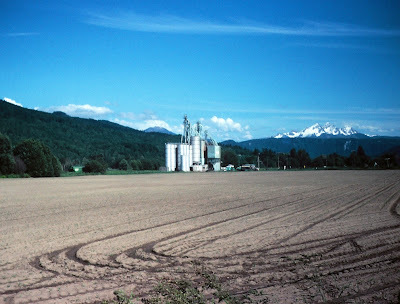 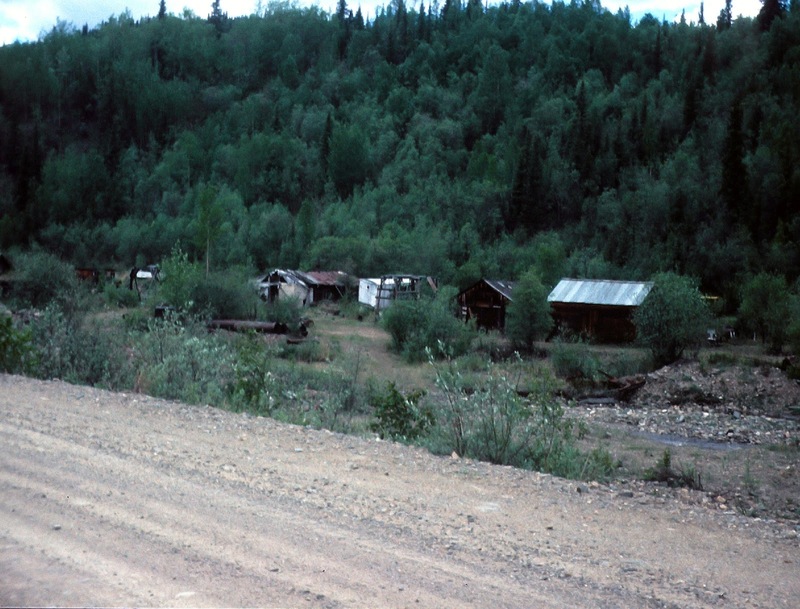 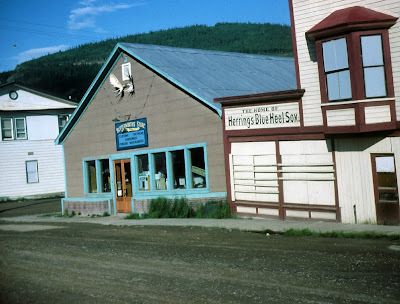 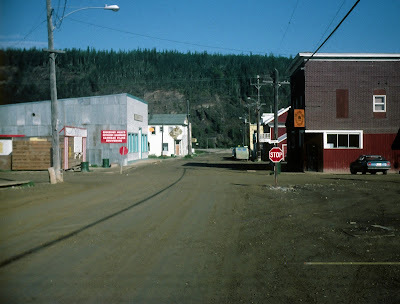 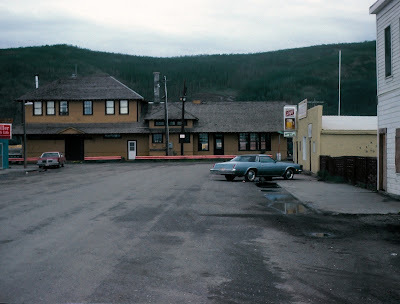 The next services were at Iskut, a very small, mostly aboriginal community in the Stikine Country of northwestern British Columbia where I came across a small co-op store with a gas pump outside. 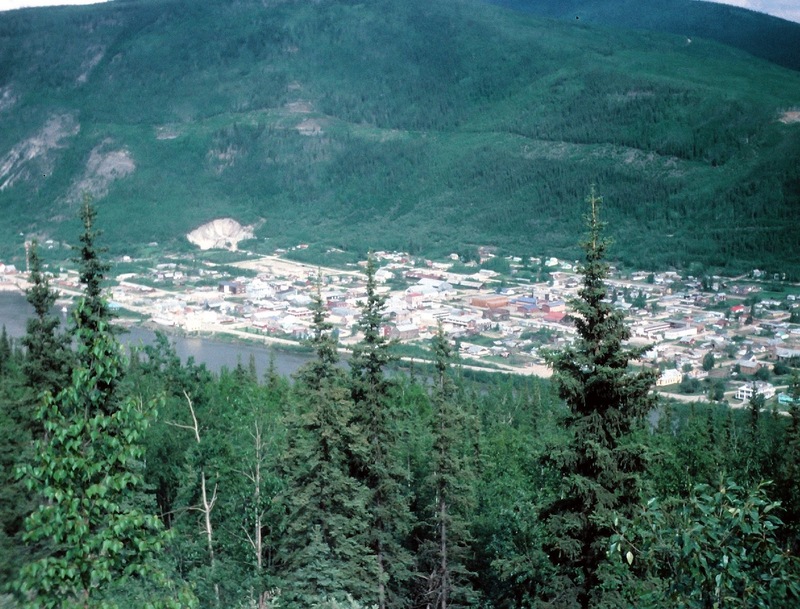 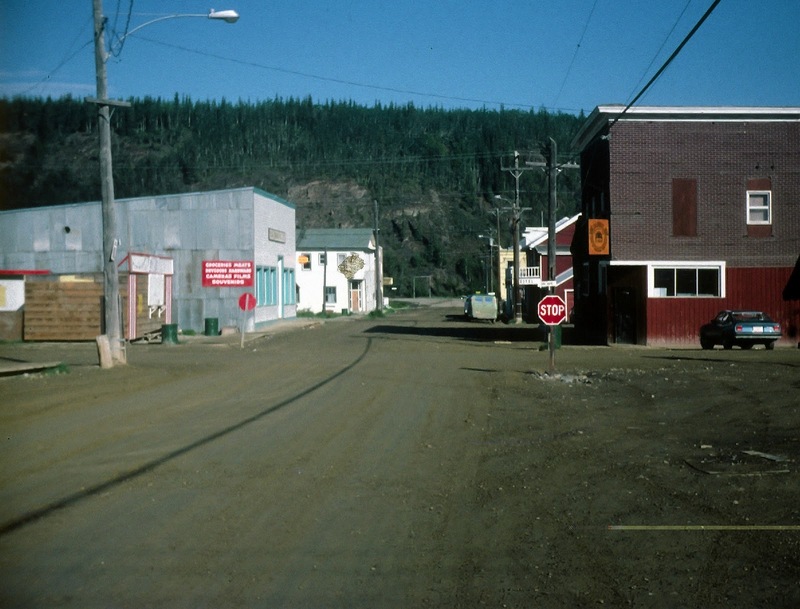 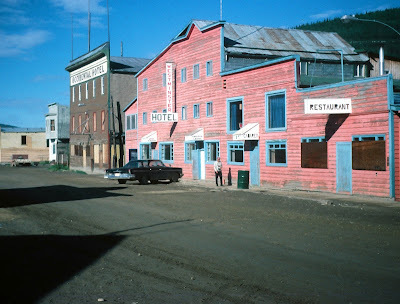 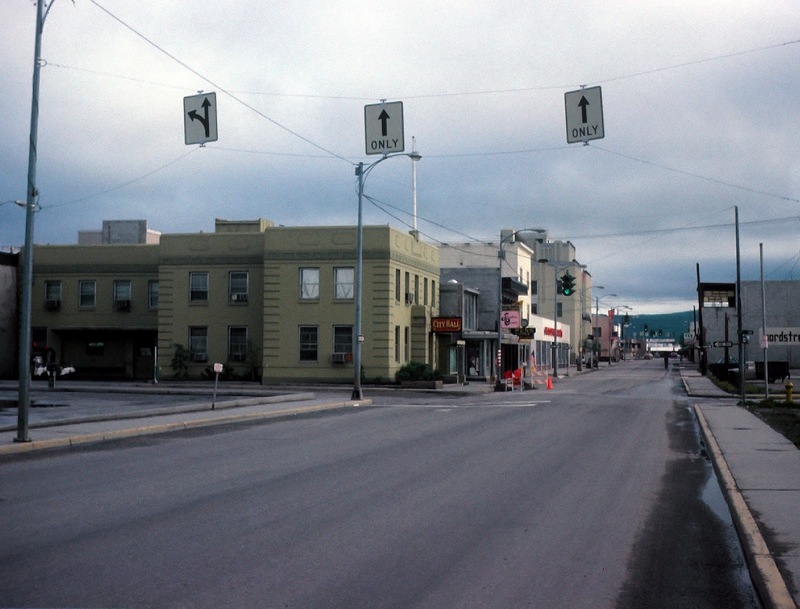 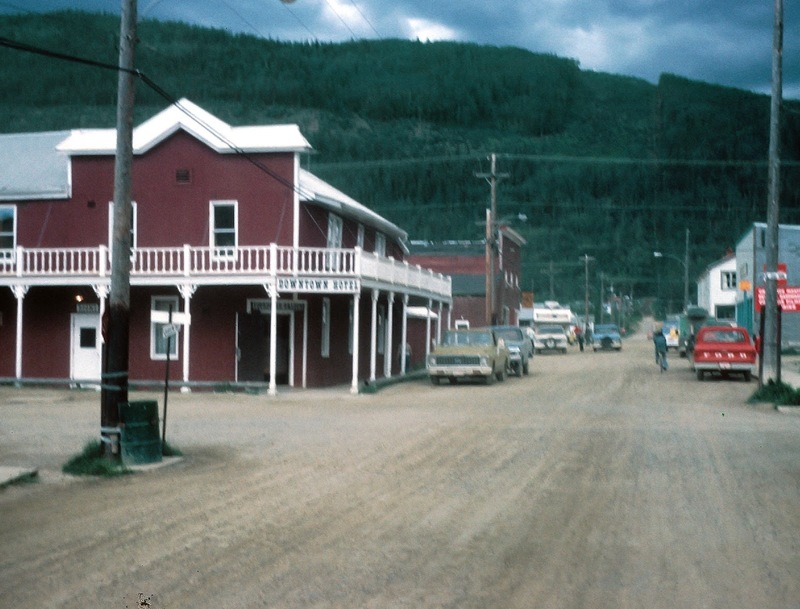 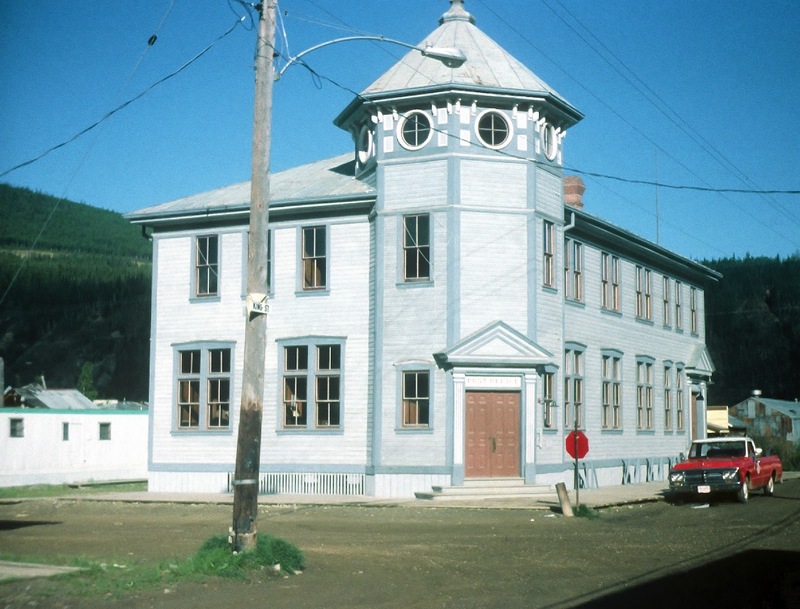 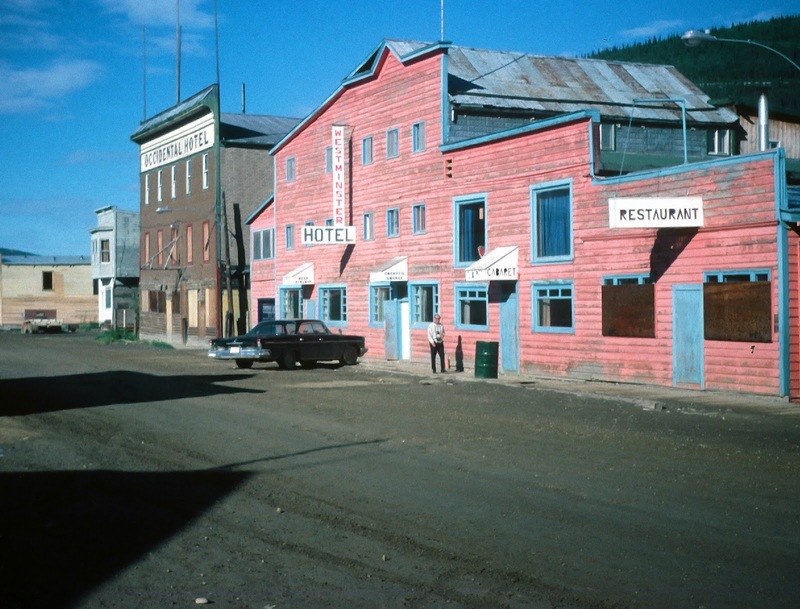 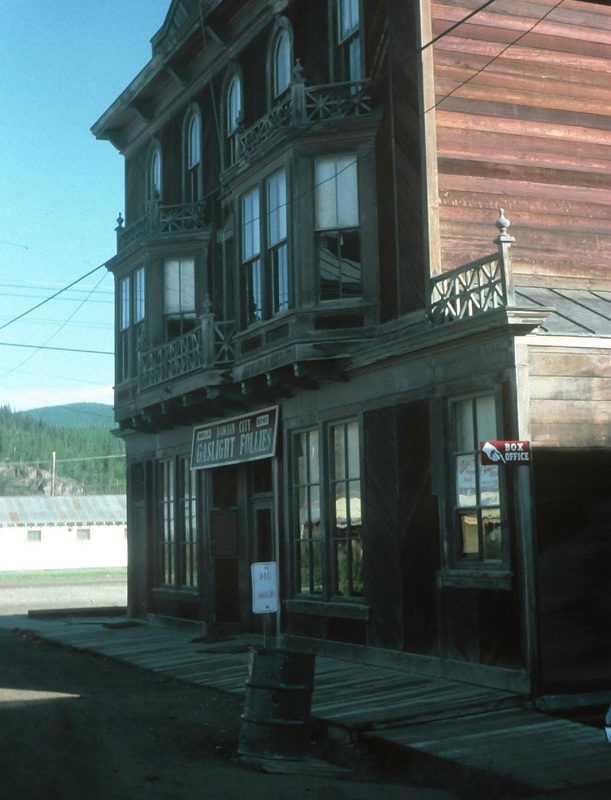 Downtown Dawson City, second largest city in the Yukon Territory. 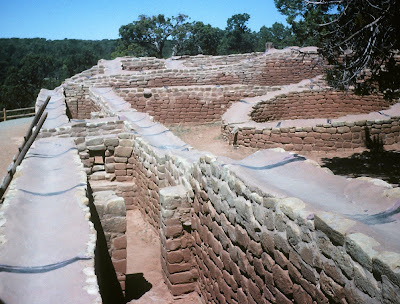 There wasn't a paved road in the entire town. 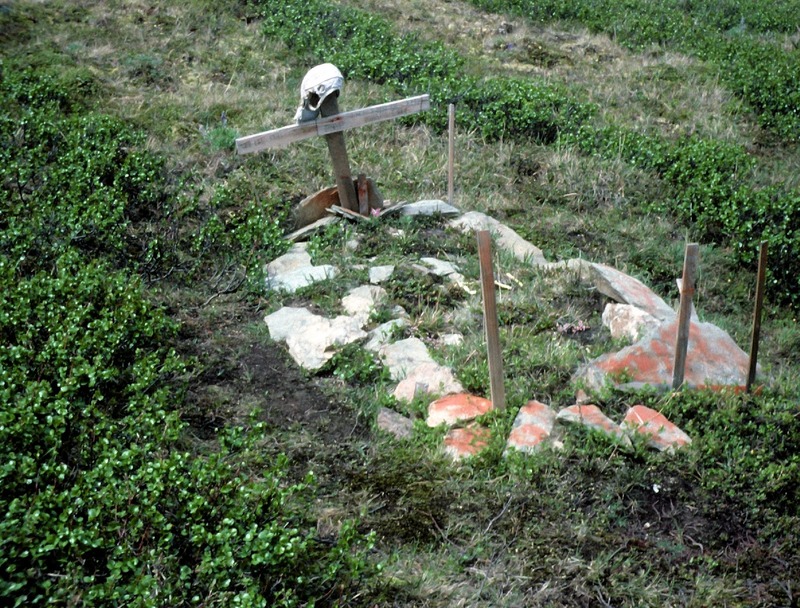 On the cross was, "The Mad Trapper - the end of his Trap Line." 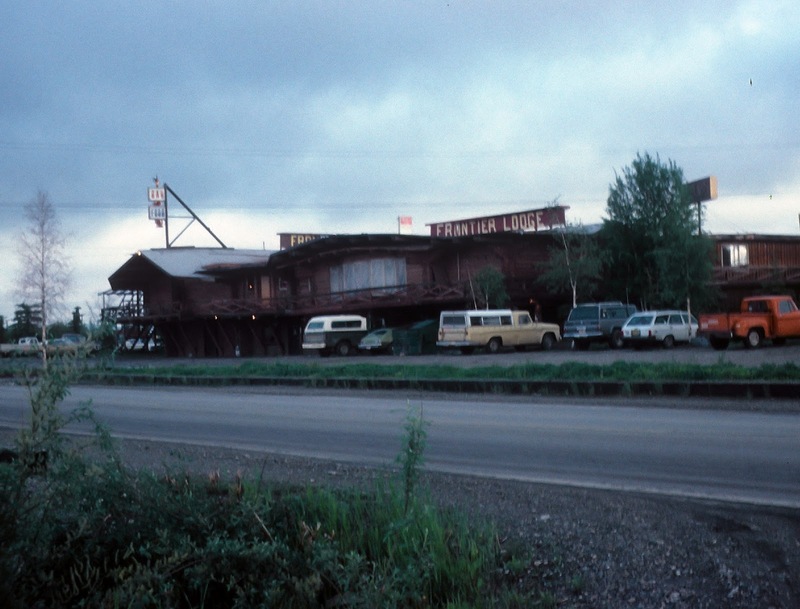 Action Jackson's place at Boundary, AK. There was a gas pump outside.